Post-earthquake, the scale of home building is a remarkable spectacle, but few homes have captured the soul of our environment quite like Black Rock House. 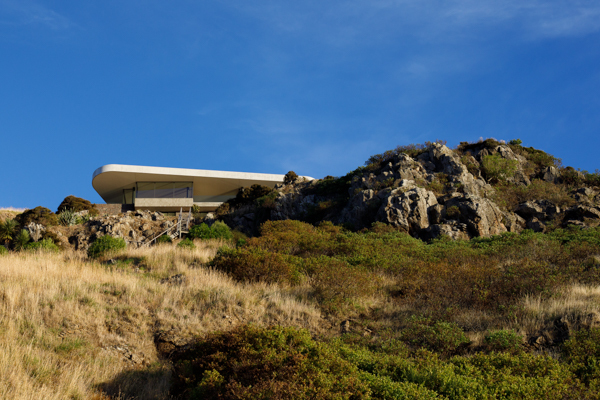 Named for its situation on the Black Rock Headland in Lyttelton Harbour, the house is as secure in its position on the shortlist of the 2018 Canterbury competition of the NZIA Awards: House Category, as it is on the dug-in platform which minimises its prominence in the landscape. With winners announced on 7 June, the judges must be impressed by the new emphasis this home gives to the phrase “locally sourced materials”. The lower floor is clad in the red rock of Banks Peninsula, dug out of its site. It’s more red than black presence blends into the surroundings, a rocky outcrop with a drop to the sea. 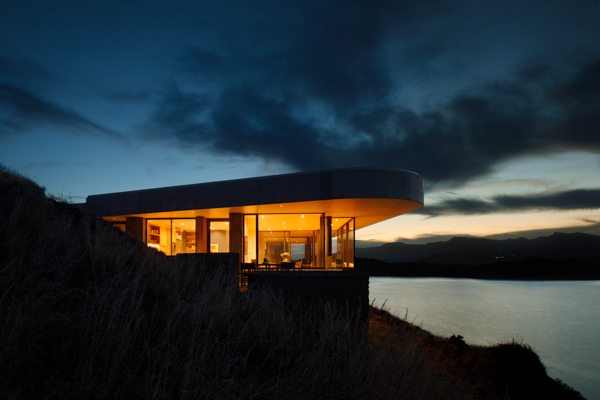 Invisible from the road above, the roof is stunning – solid concrete edged, permanent feeling, organic curves based on the headlands and bays swooping sinuously in and out around the Lyttelton harbour. Jasper’s interior favourite is a sheltered outdoor room. It faces north, where the sounds of the sea magnify as they bounce off the ceiling. Underfoot, the teak decking takes you back to the days of the sailing ships that plied their trade in the harbour. The steep rocky hillside had its challenges, but the experienced team of subcontractors with a background in this type of project, created the very special outcome. Greg feels privileged to have worked with Sheppard and Rout and the owners to build a home that reflects well on the design of the era – creating its own piece of history. Bowater Builders has another architectural build in the 2018 NZMB House of the Year competition. Sydenham Joinery was chosen for its high end bespoke quality service. Manager Grant Weston ensured an elite finished product to meet the standards of the home and its outlook. “Working with Sheppard and Rout on architectural builds is an organic and very rewarding process,” Grant says. 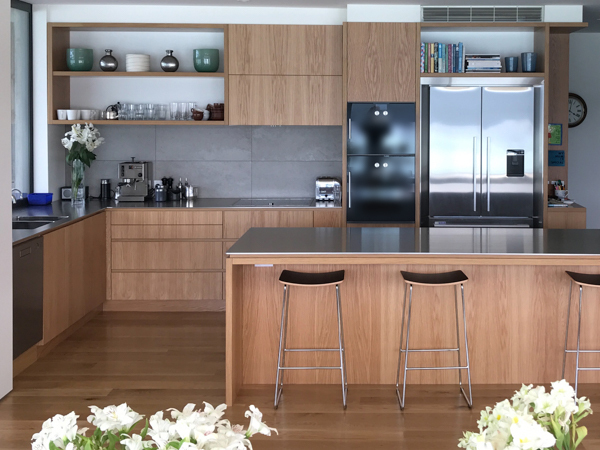 Modern styled, the materials are American White Oak timber veneer, paint lacquer in darker moody blues, and the kitchen in solid stainless steel plate. Stunningly crafted window seats in the kitchen provide a spot to contemplate the view, while the beautiful joinery combinations flow through the dining area and outdoor room, to the luxury of the library fitout.